Why not have a little fun with your STD cards. 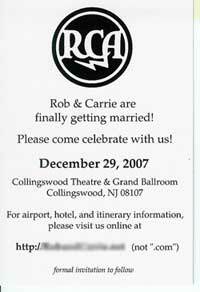 You can save all the formal stuff for the actual wedding invitation. Let loose a little like these readers have done and create something fun and carefree. And I reckon you can't get much more fun than a comic book character theme. 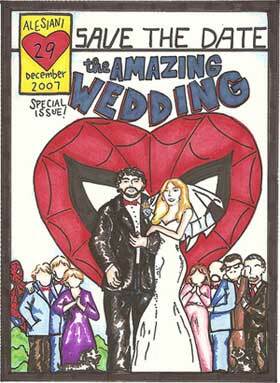 My spiderman save the date cards were made by my very talented friend Melissa. She drew up a pencil sketch, we revised it a few times and then she did an ink trace for the outline. She then used paint pens, sharpies, & markers to fill in all the colors. We drew it a few times larger than I wanted. That way it could be scanned and shrunk down and still maintain the clarity and crispness. The digital file was saved as both a .jpg & .pdf. I used Prints Made Easy to print up a bunch of 4x6 double-sided postcards. We put more details & our website on the back. 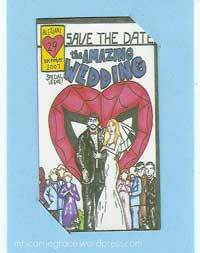 They were very inexpensive & I was very pleased with the colors and quality of the final product. I used the same design and printed business card size magnets through VistaPrint. I signed up for their mailing list and waited for one of their free magnet offers to come around. The magnets were ok. I thought the quality & colors wasn't as bold as I'd like but they were free! VistaPrint's customer service said they would have looked better if the resolution had been 300dpi - which it wasn't. At the moment you can get any sized magnets for 1/2 the normal price with this offer. Not quite free, but still really good.